Everyone loves a good movie but a really, really good movie starts with a great story. In the olden days, families gathered around a fire and listened to the clan story teller weave an epic tale of daring do to captivate listeners. Times changed with printing and even later radio became the new story teller, holding listeners in thrall. Radio stories are wonderful because they include sound effects and skilled actors to weave the tale. Eventually, all this gave way to cinema. It sometimes seems as if nothing can compare to the way films transport us, taking us to other worlds and other places. Unfortunately modern films often rely too much on special effects, drowning us with elaborate visuals but leaving us drenched in CGI. We crave the story that transports us by allowing us to use our imaginations. As listeners we long to be lead down an enchanted path, not beaten with pounding explosions and gratuitous visuals. What we want, what our minds reach for, is a mind movie. A story-centered tale told simply and well, with descriptions of sound so well-placed and evocative that we are transported rather than drowned. Audio books are the perfect medium for this desire. Like many others, I began listening to audio books while traveling to pass the time along the way. The voice over actors are so talented that it is often difficult to believe that only one voice creates all those different people. What began as a way to pass the time became a full blown obsession. I am never without an audio story playing in my home. Over the years I have introduced many to the wonders of audio! This includes parents who have been distressed at their children’s indifference to literature. 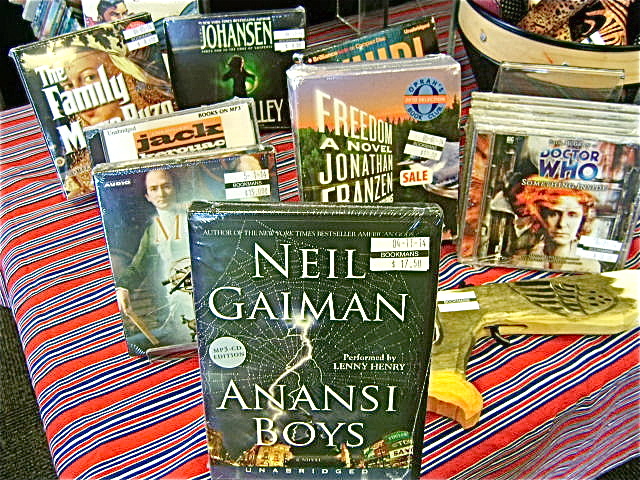 Many parents successfully introduce audio books to their kids as an alternative to T.V. and video games. These children become life-long lovers of the written word, even when it’s spoken. Many children’s books come in a book plus audio format, which enables parents to give the child the book and let them follow along to the story. It’s a great alternative for too busy, often stressed parents who are unable to read to their little ones as often as they might like. And why not have a classic (or even not so classic) story playing in the car on the way to school, home or while running errands? Some argue that they can’t sit still long enough to hear the stories, my reply is, “Who says you have to sit?” The beauty of audio is that it CAN travel with you, a wonderful distraction while completing the necessary tasks of the day. If you can whistle while you work, then you can listen while you work (as long as the work doesn’t involve reading).